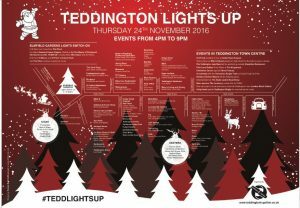 Stone Rowe Brewer will be providing passers-by with candy floss and wine this Thursday evening, when Teddington once again looks forward to its annual Lights Up event. The traditional start to the town’s Christmas season is a hugely popular event, with the roads closing to allow local residents to walk along the High Street and enjoy genuine community spirit – and Stone Rowe Brewer are proud to be collecting donations for Teddington-based charity, Cross Roads Care, on the evening. Please pop along to say hello and to raise a glass, or a candy floss stock, and make a donation in support of the great work Cross Roads Care provide for local children, carers and those suffering with dementia and to meet some of our staff. We are at 72 High Street, Teddington, next to Starbucks.